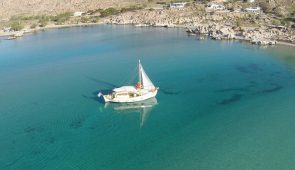 There are various type of boats available for private charter in Paros. Starting from 4,0 m long having just a car drivers license & not younger than 21 y.o., up to 8.0 m having a speed boat license. There is a possibility charter a private boat ( rib) with skipper or a sailing yacht or motor boat even though a traditional wooden boat ( kaiki). Depend on your mood and your ability, you may enjoy a short sea ride or a day cruise just for your Family or friends . Different type of boats are chartered for the transportation of your guests or some special events depending their capacity. A traditional wooden boat very well maintained and refurbished to carry passengers. 13m in length, 4.40m in width and capacity for 25 people.